Throughout the 130-year life of the QTU, its members have freely chosen and committed to maintaining and renewing a democratic structure. QTU membership renewals are due by 31 March. It is important to remind your colleagues that their eligibility for access to the QTU’s legal assistance scheme is based upon their financial status at the time of any incident occurring. Tell Philippine government: "Hands off our teachers"
Teacher unionists in the Philippines are being profiled and harassed by their government, in contravention of commonly agreed human rights. The Queensland College of Teachers (QCT) has announced the appointment of a new director, Deanne Fishburn. The fact is, like the rest of our nation, Australian teachers and principals need a pay rise. The value placed on any professional is not measured by pay alone, but it is a strong indicator of the worth our community places on the roles we play. The QTU is proud to announce a new and exciting initiative - QuEST (Queensland Education Support and Training). The QTU believes that the 2019/20 State Budget will demonstrate a clear commitment to the future of public education and training in Queensland. 40 per cent of the estimated 6,700 languages spoken around the world are in danger of disappearing, including many in Queensland. Our schools are at the forefront of the battle to save them. The QTU’s “claim and complain” campaign for fairer payment for preservice teacher supervision continues to make waves. Labour Day has a rich and colourful history across Queensland, and in 2019 it is shaping up to be a long weekend filled with union pride and family friendly celebrations. A QTU-commissioned survey of members in schools has thrown a spotlight on the working hours of teachers and education leaders. QTU member Sarah Dioth divides her time between two of Queensland’s remotest communities. Here she explains the challenges and benefits. When QTU members floated the idea of forming a special interest group to support the work of our Union on refugees and people seeking asylum at the 2015 State Conference, we could not have anticipated the results. 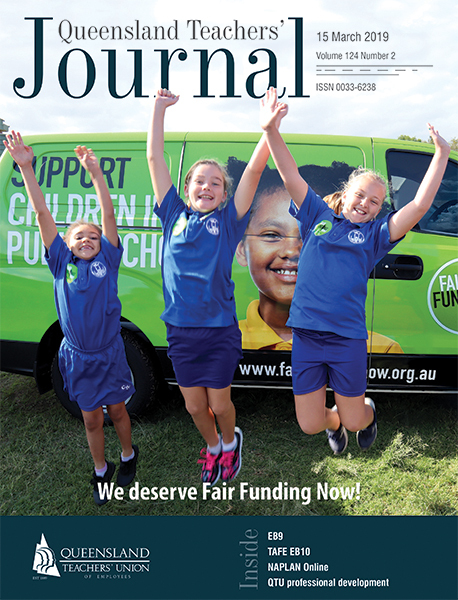 February’s AEU Federal Conference addressed a range of issues, including Fair Funding Now!, emerging trends in education nationally and internationally, and Change the Rules. Confused about the locality allowances? Teachers working in certain rural and remote areas are eligible for locality allowances if they are based in centres named in the locality allowance public sector directive.